The midi you are listening to is a traditional tune called, 'Early One Morning'. 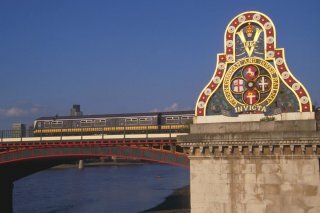 Blackfriars Railway Bridge, (the new one), was built between 1884 and 1886 to a design by John Wolfe Barry and H. M. Brunel. It was orginally called Saint Paul's Bridge because it carried trains to Saint Paul's Station. When the station was renamed to Blackfriars Station, in 1937, the name of the bridge changed. There are the remains of a second railway bridge immediately behind it.